In comparison to August, September has been blissfully quiet. After a few days break to allow Nonie to recover from the trip home, we were back into the swing of things preparing for another clinic with Danielle Keogh. It was at this clinic, that I got to road test the new Wilson Equestrian Navy Super Stick Breeches (a birthday present courtesy of my partners family). I love the extreme stick that these breeches boast and the bright blue Wilson’s logo detailing on the pocket. In the lessons we focused on improving the canter and counter canter in preparation for teaching the flying changes. Needless to say I’m pretty excited to see Danielle again in November! My homework in the meantime is to make Nonie as adjustable as possible, so we are playing with the gear changes and the angle within the lateral work. Our trip away in August meant that we unfortunately missed out on competing at the Townsville Dressage Club Championships. I was really please here that my friend Morgen Schneider and her horse Riverside Klark Kent won the Elementary Freestyle and were also the Novice Champions at this event. They are definitely a pair to watch in the future. The last weekend of September saw the kind of perfect weather that is normally reserved for novels. Luck was on our side and the spectacular weather lined up with our plan to take the ponies to the beach. I like to get Nonie out of the arena as much as I can and during the off season my favourite way to do this is definitely a trip to the beach. Nothing beats playing in the waves or a gallop through the shallows. I wore my Emerald Wilson Equestrian Super Stick breeches, the colour is even more stunning in real life. For now, we are working towards a few local competitions which have been announced for October. We will be riding our first ever dressage freestyle and we may even end up in hack ring! 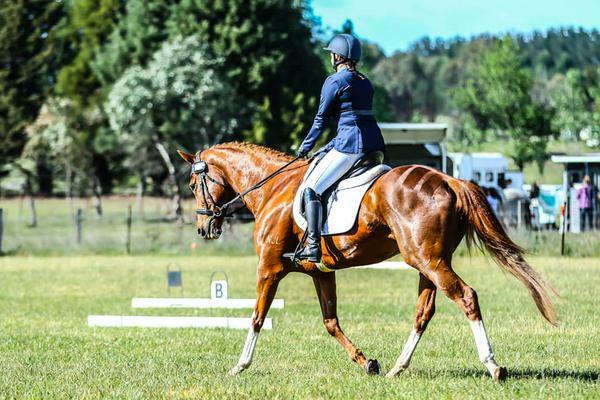 This entry was posted in Team Riders, Uncategorized and tagged Andrea Parker, Beach Horse, Dressage, Super Stick Breeches. Jessie Smith – An interesting couple of months!